Money Talks – or Does It? A long time ago I tried my hand at paid promotions on Facebook and got nowhere. Throwing $5 at it produced virtually zero results. The system was very different then, however, and after all the jazz about Russian meddling in the election for very small amounts of money on a per-meddle basis, I figured I’d give it another shot. For this experiment I’ve promoted two things: the “Shop Now” button on my Facebook author page and the Books & Brews event other Falstaff Books writers and I are holding in Durham, NC, next week. I timed the “Shop Now” promotion to coincide with the relaunch of The Withrow Chronicles from Falstaff Books in August of this year. Creating the content for the ad was trivial. I wrote a description and updated my cover photo. The end. (Writers love writing those two words, even in the middle of a paragraph; sometimes, perhaps especially in the middle of a paragraph). Facebook strongly urged me to keep the text very brief so the entire thing would show up when the ad appeared on mobile clients, putting it in the length-limitation realm of being practically a tweet. What required real effort was step two, in which I targeted an audience. My experience at conventions has been that overwhelmingly the readers who hear the sales pitch and buy the book are women between the ages of, say, 25 and 55. I targeted the “Shop Now” promotion at a superset of those readers to try to capture that demographic of core supporters and readers: women, aged 18+, with any one of 17 distinct “interests.” “Interests” boil down to the characteristics in that user’s “About Me” information (you know, the section of your profile Facebook is always bugging you to complete?) and any pages they’ve “liked.” The 17 “interests” I chose included things like “North Carolina” and “Books” but also things as specific as “Buffy the Vampire Slayer.” I was painting with a broad brush, and I thought that would increase my reach and therefore my success. I also was fairly expansive with where the women shown my ad could reside: I made sure to pick basically every primarily-English-speaking nation, on the theory others might not think to target, for instance, New Zealand. Finally, I set a budget of $35 for the promotion and set it going. At the conclusion, Facebook reported they showed my ad to 3,237 users in the targeted group. Of those, exactly 44 clicked the “Shop Now” link. As an absolute novice at marketing – compounded by my incredible hesitancy and anxiety when it comes to promoting myself – I thought 1.35% was a terrible conversion rate. I did a little reading, though, and it turns out direct-mail marketing campaigns (which, I mean, this isn’t direct mail, but it’s certainly putting something disposable in front of strangers and hoping for the best) have a response rate in the 0.5%-2% range. OK, so maybe that 1.35% wasn’t so bad. Still, on average, just breaking even is going to require three-quarters of those women to spend a dollar on my books when they get there. I decided either I am not interesting as a writer, I’m not great at marketing, or I need to tighten the focus of my targeted users. To that end, I created an overlapping but not identical group of users to target with a promotion for Books & Brews: men and women, ages 25-65, with specific interests in writing, publishing, urban fantasy, westerns, and other things much more closely aligned with the writers who will be on hand at that event. For instance, the event is being held at a craft cocktail bar called Arcana, so I also targeted users with an interest in cocktails but not beer. As I understand it, if someone likes cocktails or likes both cocktails and beer, they may be shown the ad; if they like only beer, they won’t. Sure, Arcana sells beer, but that isn’t what they’re known for and that won’t be the hook that gets someone to show up to our event. After all, we’re all coming up with a cocktail recipe related to our books. None of us is going to invent a beer. I even went so far as to specify users with moderate, liberal, or progressive political views. Falstaff published an entire anthology of stories to support groups working against North Carolina’s HB2, a law harassing the queer communities and especially transgender persons. The results so far suggest much better conversion with this promotion. The targeted audience all have to reside with 50 miles of Durham, NC, so the audience is much smaller, but my budget is also smaller. With a total budget of $20, I’ve had the ad running for most of the month of October. So far, it’s been shown to 423 users, 10 of whom have marked themselves as “interested” or “going.” That’s a conversion rate of 2.36%, above the conventional wisdom average and a full percentage point higher than the promotion for “Shop Now.” I’ve spent less than 50% of the budget, also. I’ve got over $11 of that $20 left to go with the promotion scheduled to run through the day before the event. 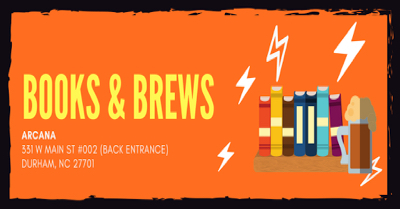 If that response rate holds, I’ll probably drum up a couple of dozen potential attendees who otherwise wouldn’t have known about Books & Brews at all. I’ll be damned pleased if half dozen of them actually show up. If that occurs, I will consider that $20 very well spent – plenty of reason, at the very least, to invest more time and energy in figuring out a target audience who will connect with my books and events on Facebook without a ton of effort on my part. If you have any experience marketing through either Facebook or Twitter, I would love to hear it either here or via email! ← Withrow #5 Update & Preorder Links!